One of the groups who really appreciate our outreach is the Garden Club of Georgia. So we were again at the Jon Wood Field at CEWC to show these young people the wonders of the night sky, and they got to see three planets, Venus, Jupiter and Saturn as well as some other objects the naked eye cannot see. However, this year was a bit different since the New Horizons space craft was less than two days from making the Pluto system fly-by. In order to show the campers how “light” it gets on Pluto at its noon, we made a picture of the group at 8:54 PM. That’s when it was as light, or dark, at the field as it is on Pluto at Noon (#Plutotime). A great event again and thanks to Marie, Tim, Frank, Heather and Theo for making this happen. As Molly Kimmler, the event organizer, said in her email: “What a great night. You guys are the best!!!!! Molly”. 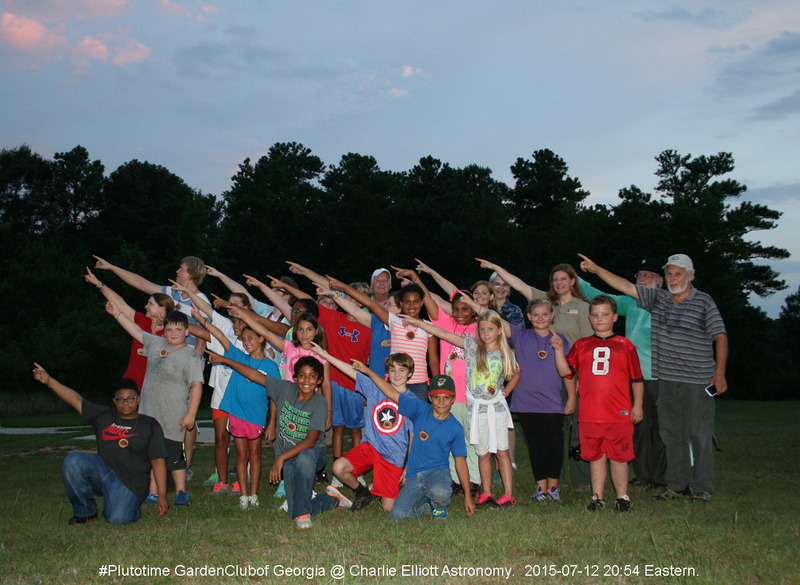 The image shows the group at “Plutotime” pointing at where Pluto had just risen just above the horizon.